Over at his German Nachtjagd blog Luft.hanseatic has written a number of most interesting posts dealing with the camouflage and markings of wilde Sau single-engine night fighters. The Bf 109 of JG 302's Fritz Gniffke, featured elsewhere on this blog, and the Fw 190s of II./JG 300 are just two of the subjects considered. 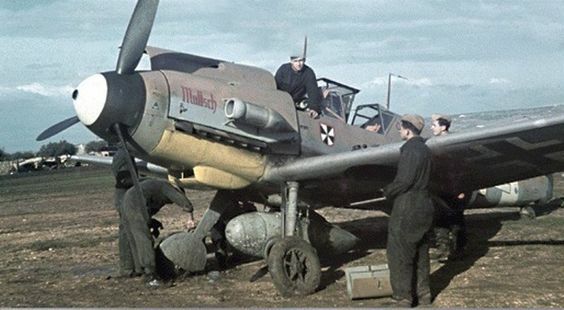 His careful analysis of the available documentary sources and web sites warrant a detailed reply and JG 300 historian Jean-Yves Lorant was kind enough to respond with rare photographs and log-book entries, specifically in this first post, on the question of Lt. Klaus Bretschneider's 6./ JG 300 Fw 190 A-7 Neptun. We will look again at Gniffke's 'Yellow N 7' shortly. Bretschneider's FuG 217 Neptun radar equipped Fw 190 A-7 seen at Rheine during early 1944 (above) was one of the many photographic highlights of Vol I of the two volume history of JG 300 written by Jean-Yves Lorant and Richard Goyat, which according to the Eagle Editions web site is now sold out for the English-language edition. Captioned as 'Yellow 1 N' the image depicts II./ JG 300 mechanic Wilhelm Beissel seated on the horizontal stabiliser. Camouflage netting has been partially unfurled over the forward fuselage and the wings. The ground crew have carefully avoiding covering the antennae of the FuG 217 Neptun radar which are set obliquely across the upper wing surfaces and in the MG cowl cover. Beissel, who passed away shortly before publication of the book and Lorenz Foag, seen in the 'darker' view of this same aircraft, have both confirmed Bretschneider's 6./JG 300 A-7 Neptun was indeed - as would be entirely logical for a 6. Staffel machine - 'Yellow 1 N'. The JG 300.de website has the '1' in red and we can categorically state that this was not the case. We have pointed out quite a few errors on that site in the past, eg Kurt Gabler's 'Red 8' attributed to Lt. Rudi Winter, Herbert Kaminski identified as Kurd Peters, not identifying green numbers on 11./JG 300 aircraft etc etc. This is another. Note that Klaus Bretschneider flew through the 'wilde Sau' period with 6. Staffel. Note Bretschneider's victory markings on the rudder - even aside from any personal testimony this aircraft simply has to be 'Yellow 1 N'. Furthermore the small letter 'N' for 'Nacht' (or Night) utilised by JG 300 during the wilde Sau period was indeed RED - again confirmed by eye-witness accounts. M. Lorant wrote to say that as it happens he has recently spent some darkroom time on this same image The original wartime print measured just 2,5 cms x 4 cms (!) and was slightly out of focus. M. Lorant has been able to 'clean up' the photo and we can now republish it in good enough quality to be able to identify the Werknummer. Close examination of the digital version of the photo negative allows the viewer to discern the last five digits - 40300. For Bretschneider's A-7 this gives us a WNr. of 340300. The 'enhanced' image is reproduced here courtesy M. Lorant. Click on the image below to see a close-up. The illustrators of the two volumes of the JG 300 history (Sundin for the French edition, 'Bataille dans le Ciel d'Allemagne, Editions Lariviere, 2005, Tullis for the English edition) both took educated guesses on their artwork but, aside from the incorrect WNr., in our opinion Claes Sundin's artwork published in the French edition of the JG 300 history is visually most realistic. Although Klaus Bretschneider flew through the 'wilde Sau' period with 6. Staffel, there is, in M. Lorant's view, more of a case for considering that the photo of Bretschneider climbing from the cockpit of Fw 190 A-6 '3 or 8 N' depicts a 5. Staffel machine - hence a red Kennziffer in this instance. It is important to remember that serviceability issues meant that relatively few wilde Sau aircraft were operational at any given time, that wilde Sau sorties were often flown in isolation and that pilots could be assigned aircraft very much at the last moment. Log book entries also show that wilde Sau pilots often flew a number of different aircraft over a period of time - more of this in another post.